Jane Bunnett, the soprano saxophonist and flutist whose name is synonymous with Afro-Cuban jazz, is being cued in thick Spanish, politely but insistently. 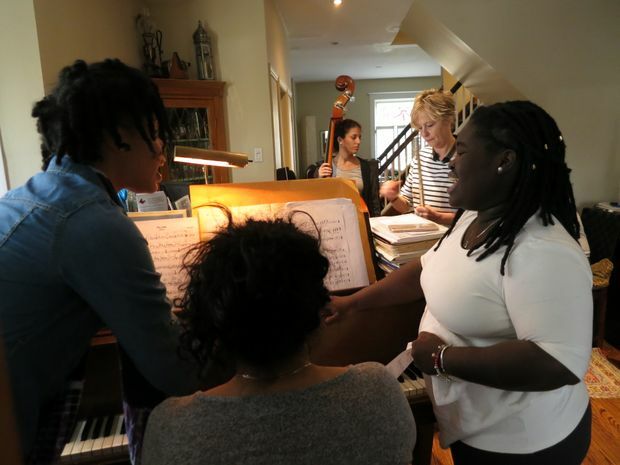 As she stands, flute in hand, by the baby grand in her dining room-rehearsal space, Ms. Bunnett scrambles with the cues from the young woman on bass – “Yayne!” – marking another spot to insert an improvised flute line on the upbeat. For a few bars, as the band calls out to each other, negotiating the myriad cues, Ms. Bunnett is getting some schooling from a musician much younger than she, and whom Ms. Bunnett is in some respects mentoring. It’s a wonderfully congruous exchange, for Ms. Bunnett has spent her career immersed in Cuban music, studying its intricacies. Based in Toronto with her husband, trumpeter Larry Cramer, she has been a crucial, cultural go-between since the 1980s, matching the best of Afro-Cuban jazz with audiences outside Cuba. And so, here she is in her home in Toronto’s Parkdale neighbourhood, learning the off-kilter cues from the young Cuban bassist Tailin Marrero. The rest of the group, all young Cuban women, sing out from behind their instruments as the chorus floats through Ms. Marrero’s melodic piece, Musica en la Alma, with its characteristically Cuban two-step trot. With a career brimming with Cuban collaborations, Ms. Bunnett has for the past four years been the founder, mentor and part den mother of Maqueque, this collective of young female musicians. The group makes a statement on the outmoded male dominance in Cuban jazz as much as it makes an artistic statement by some of the most dynamic, young female musicians from Cuba. The rehearsal is taking place prior to recording a new album in Toronto and tonight’s concert at Koerner Hall. They have come off an extended fall tour and are staying at Ms. Bunnett’s house. The idea for Maqueque has always been clear to Ms. Bunnett: to help the women rise above the high level of competition that exists within Cuba’s music scenes and conservatories and the machismo that can stand in their way. The group is not a show band, she adds. “The idea of the group is to mentor young women and really encourage them to go to their full potential,” Ms. Bunnett says. Having a career in Afro-Cuban jazz means the continual headache of getting travel visas for the musicians to and from Cuba, especially when that also entails gigs in the United States. And the band members’ growing stature and individual tour schedules inevitably conflict with Maqueque’s. The downside is that some have to pull out of some performances. The upside is that this allows other women to join, creating an evolving, constantly re-energizing mix. On the day of the rehearsal, walking into Ms. Bunnett’s house warrants a pause for reflection on the talent in the room. Sitting by the window, adding percussion and punctuated vocals, is singer-composer Melvis Santa, a founding member of Sexto Sentido, dubbed Cuba’s answer to Destiny’s Child. She has since relocated to Brooklyn to pursue a solo career, in addition to Maqueque. On the opposite side of the room sits singer Dayme Arocena, signed to global soul-jazz DJ Gilles Peterson’s Brownswood label. And there’s Ms. Arocena’s former conservatory classmate, the versatile pianist Danae Olano, as versed in Chopin as in Chucho Valdes (the Cuban piano great). Yissy Garcia and Mary Paz are on drums and percussion. Each musician is highly accomplished on her own. And yet, here they are all staying in one Toronto house, so far from the Cuban sun, checking their cellphones between songs like any young person does. Ms. Olano, the pianist, notes that the heavy competition in Cuban conservatories is worsened by a bias toward classical music. “We don’t have jazz schools,” she says. And so, the problem is that after so much classical training, conservatory students have a difficult time knowing how to fend for themselves in the pop and jazz world. Yet, Ms. Olano adds that knowing classical technique is a major advantage in playing Cuban jazz. Ms. Arocena, the singer, sees biases a little differently, having come across many herself. Rather than fighting bias, she argues that it is better to focus on herself to be best she can be. “It’s stronger than just fighting,” she says in heavily accented English. But, Ms. Bunnett interjects, “you also have to remember that you have a lot more status in Cuba now than you did five years ago.” In other words, biases remain for countless other young musicians.